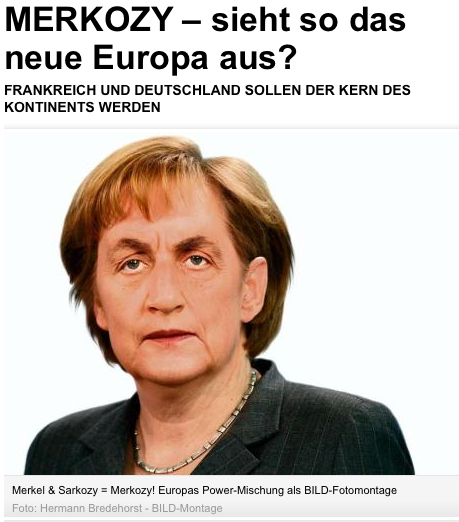 Angela Merkel and Nicolas Sarkozy (collectively known as the "Merkozy Borg") have today announced how they are going to single handedly save the €uro. A new treaty will be signed - preferably by all 27 member states of the EU but they may accept a compromise of just the 17 €urozone members - that will provide for fiscal union, oversight of national budgets by the EU (where have we heard this before?) and automatic fines for member states who don't keep their budget deficits down to 3%. Before the aforementioned treaty has been drawn up, Cameron has decided there will be no need for a referendum. In a speech in London today he said that if there was a transfer of powers to Brussels then there would be a referendum but if there wasn't then there would be a different set of circumstances. A spokesman for Downing Street was slightly more blunt and simply said there isn't going to be a referendum. We want these countries to resolve the eurozone crisis. It is having this chilling effect on our economy and the longer this crisis goes on, the worse that effect is. Which is right in a way but as usual it's only half the story. The longer the crisis goes on and the more we are dragged into bailing it out or commit to tighter integration with the failing EU superstate, the worse the effect on our economy. Cut the political union loose and go back to the free trade agreement we were supposed to have joined all those years ago and we will insulate ourselves to a certain extent from the collapse of the single currency. Regulate UK banks' lending to the €urozone and buying €uro bonds to prevent them becoming over-exposed to toxic €uro investments and even better. If there is treaty change at the level of 27, then Britain has its desires and requests to make sure our relationship with Europe is properly managed. According to the law his government passed, if there is a treaty change that passes powers to the EU then we will have a referendum. According to his party's policies, if there is a treaty change that requires the UK's signature, they will demand the "repatriation" of powers from the EU to the UK. Yet here he says "Britain" has its desires and requests if a new treaty requires our signature. Where is the Cast Iron Guarantee™ of a referendum? Where are the demands to "repatriate" powers from the EU in return for grudgingly signing a new treaty? The key priority is to get stability restored, to get a solution to the eurozone crisis. At the moment that is everyone’s priority. If treaty change is the means to that end, then we would recognise that as a necessity. Not just the key priority, the only priority. Saving the €uro is more important than national interest!